Model, designer, entrepreneur and mother of three, Kimora Lee Simmons has added beauty maven to her impressive list of credentials and appearied at Cosmetics Trend Show at Nordstrom Michigan Avenue in Chicago on September 15th, 2012. 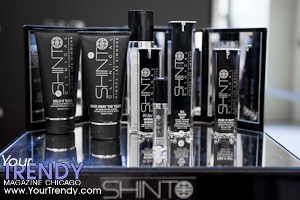 She joined beauty industry experts to debut her new clinically proven, high performance skin care line Shinto Clinical at the hottest beauty event this season. Formulated with a divine blend of ancient Asian ingredients and the latest breakthrough in Western bioactive technology, Shinto Clinical is designed to work wonders on the skin of evolving women of all complexions and cultures. Shinto Clinical specialists will also be on hand conducting skin care consultations with customers. As a lifelong skin care enthusiast armed with her grandmother¹s strict regimen for luminous skin � a recipe held tightly � Kimora partnered with Makari de Suisse and renowned New York dermatologist Dr. Eric Schweiger to develop a luxurious, results-driven skin care line. Shinto Clinical promotes long term anti-aging benefits while restoring skin¹s luminosity and vitality.